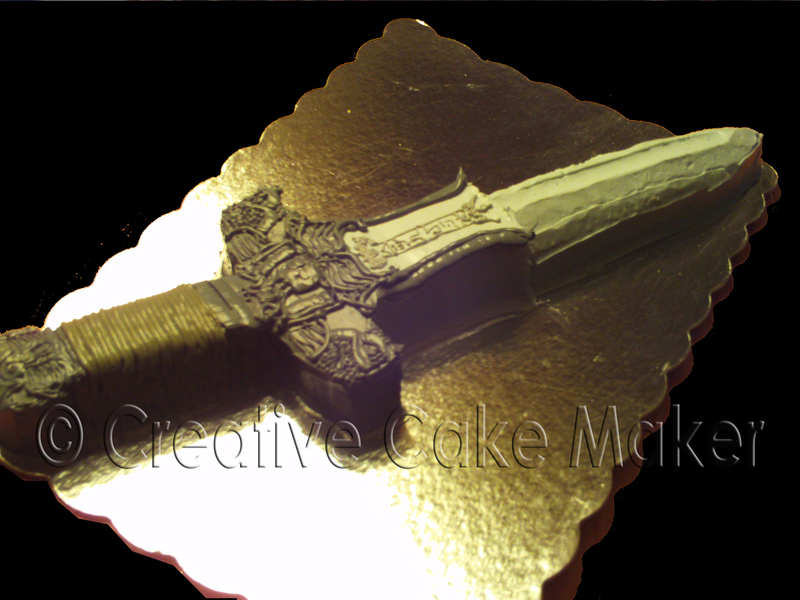 The Creative Cake Maker: "Conan's Atlantean Sword"
When I asked my husband what kind of cake he wanted for his birthday, he said a sheet cake. I just shot him a look. Then he said "Plankton". That's his favorite Spongebob character (with Mr. Krabs following in a close 2nd). We watch a bunch of Spongebob around here. I agreed to Plankton. Then out of the blue he thought of the Atlantean Sword. He said if we ever had 3 grand to blow he'd get one. Well, he got one but not quite the kind he was hoping for. He was pleased with it, though. This was made by cutting apart and piecing together a 13x9 cake. The finished cake is 20" long - half the length of the actual Atlantean sword. All you need to make this cake is 1 box of cake mix - baked in a 13x9 pan and cooled and 2 cans of ready made white icing, and black, brown and yellow food coloring gels. You also need a surface large enough for a 20" cake. You can make it longer if you want - there is enough cake to do it, but I did not have the surface area to transport it on. 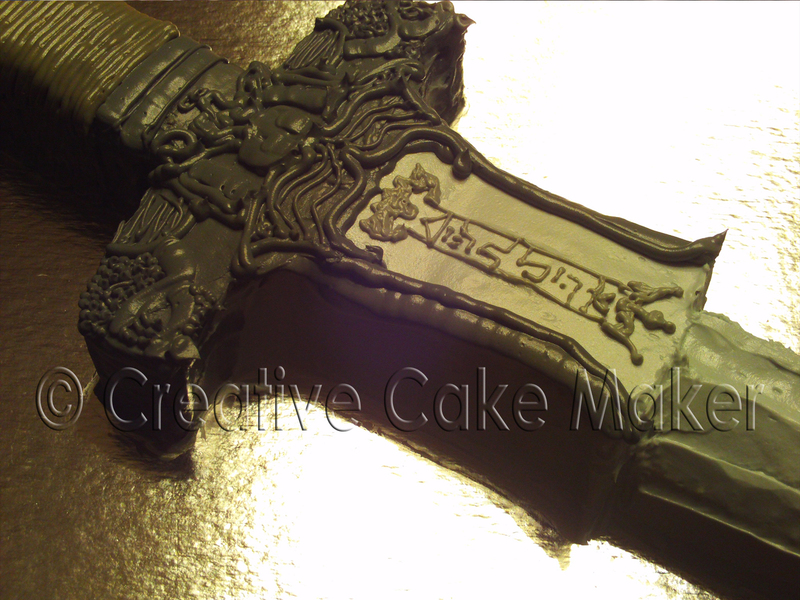 I colored some white icing with a dab of black gel to get the blade color. Then added more black and some brown gel for the bottom. The handle of the actual Atlantean sword is wrapped in some twine/leather looking stuff (my husband isn't here right now to elaborate on the exactmaterial) so I added some yellow and white to my leftover dark brassy icing and piped on the handle. The coloring was not very appetizing but it certainly made it look more real. My husband was afraid it would turn out looking too "cartoony" so he was very happy to see this! Love this cake. My daughter is having a "Zelda: Twilight Princess" birthday party and I thought I'd make the Sword of Light for her...very similar to this. What did you PUT the cake on? Did you make or buy something long enough? I actually found a rather large siver covered cardboard cake board at a party supply store. I had to measure it to determine the longest possible length I could make the cake.